Technically not a great photo perhaps, but this is such a rare and special little bird that was very exciting to find and photograph so I decided to kick 2014 off with this as the first gallery entry. The Moustached Warbler is a Winter visitor at the extreme western edge of it´s European range here at the Charca de Suarez. Rare and elusive it spends most of its time low down in dense reed beds, hopping about in search of food. Elena was first to spot this one and she knew immediately it was something different. 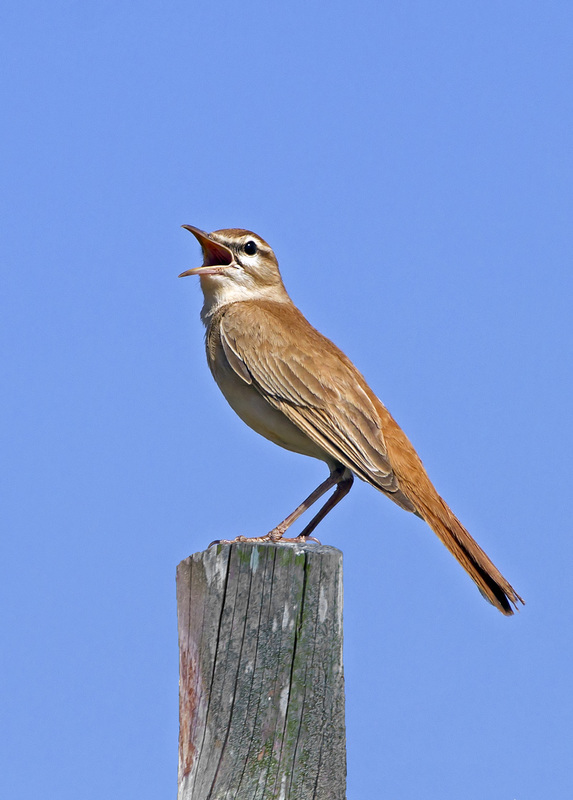 Closest relative is the Sedge Warbler but they would not be here in Winter. This may not be the most stunning photograph, and frankly the Dotterel is not the most colourful or photogenic of birds. But it is scarce! Not many reports come in of sightings of this elusive species in Spain, so it holds the bird of the month title for February. We were delighted to find a group of them close to a beach in Cabo de Gata. Thanks to Mick Richardson for pointing us in the right direction. This is another quite special bird and well worth a gallery inclusion. The Great Spotted Cuckoo is a brood parasite, laying its eggs mostly in Magpies nests. It is known to eat the hairy processionary caterpillar which is a nasty pest and is distasteful to most other potential predators.. 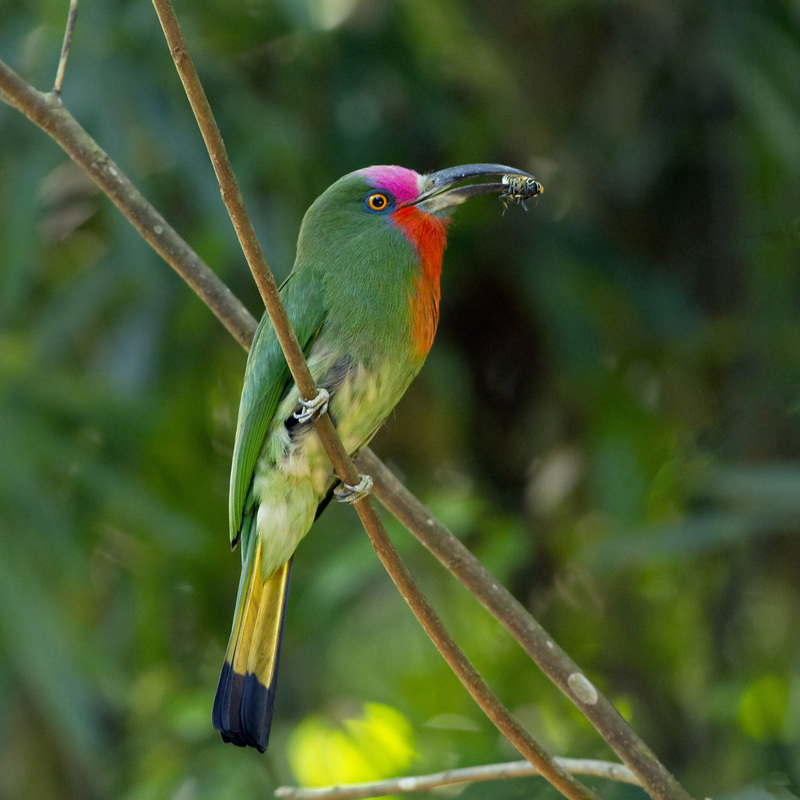 This bird was one of a pair seen near the village of Huetor Tajar in Granada Province. 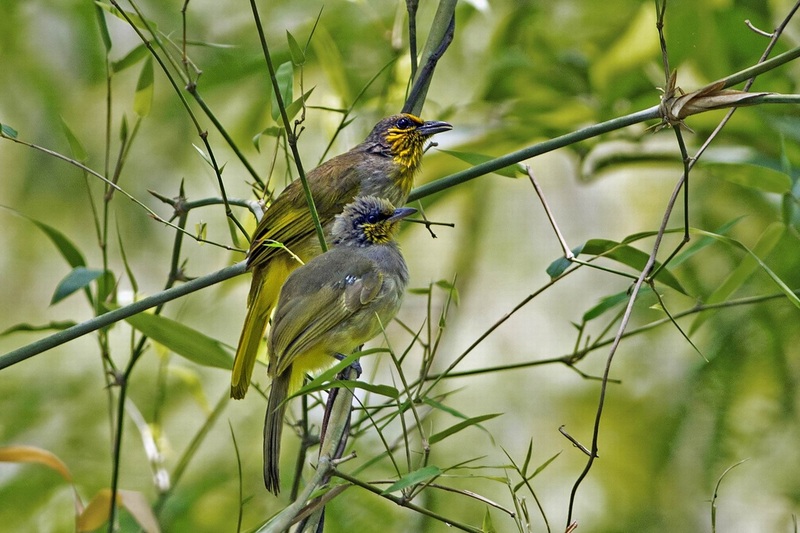 This is one of a series of shots of a pair of Stripe Throated Bulbuls. There was obvious affection between the parent and a newly fledged chick, with mutual preening and physical contact. The soft green filtered light of the forest in Cat Tien National Park, Vietnam gives the shot a nice feel so it is a gallery entry for April. 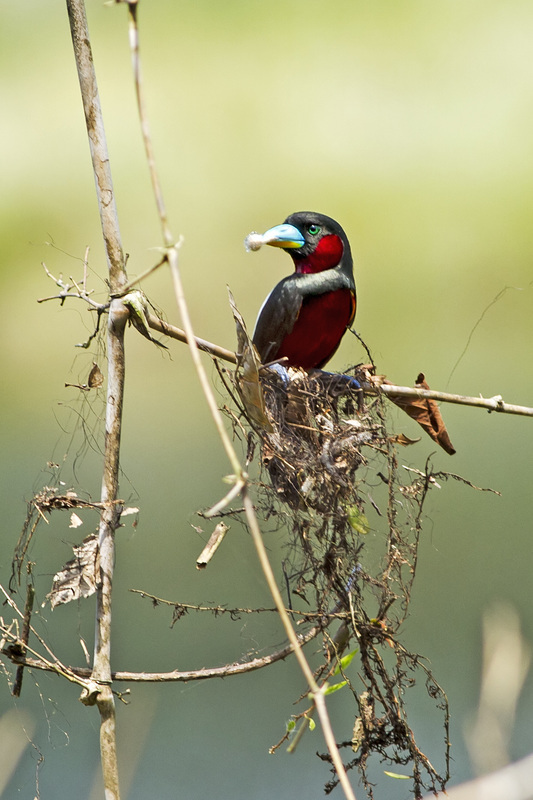 This Black & Red Broadbill is one of a pair constructing their nest on a branch overhanging a stream by a beautiful lake in Cat Tien National Park, Vietnam. We had trekked through dense rainforest for two or three hours to reach this idyllic spot but it was well worth the effort, not just for the Broadbills but for the ten or so other "Lifers" seen at this amazing spot. Broadbills have to be one of my favourite forest bird families. There are many spectacular birds in the jungle but not many quite so photogenic as these. They often sit in exposed positions allowing good photo opportunites. Very unlike Pittas and Trogons which are equally or more colourful, but shy and elusive, much harder to capture. 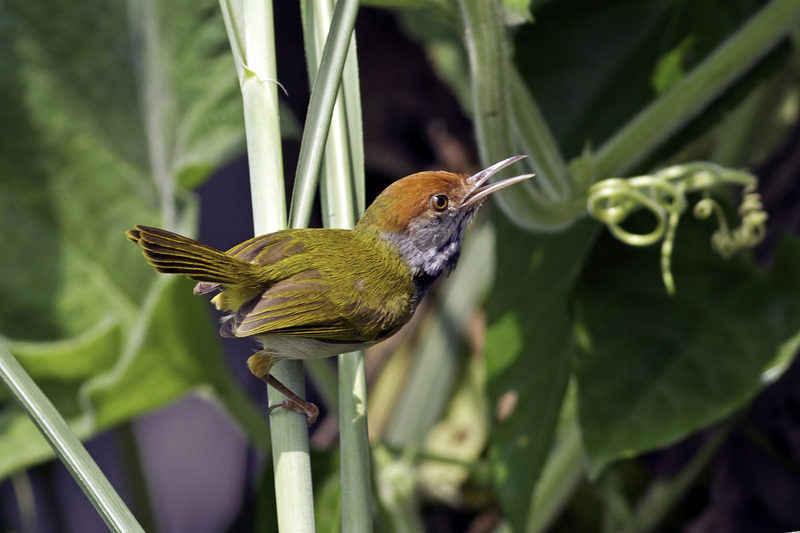 The Dark Necked Tailorbird is not a rare or elusive bird of SE Asia. They are often seen in gardens and around human habitation and I caught this one in a small Vietnamese village as we disembarked from a boat trip. Good light and composition and an attractive little bird make it worthy of a another gallery photo for April. On the same trip that I captured the Tailorbird I also managed to catch this Stork-Billed Kingfisher diving for fish in the river. 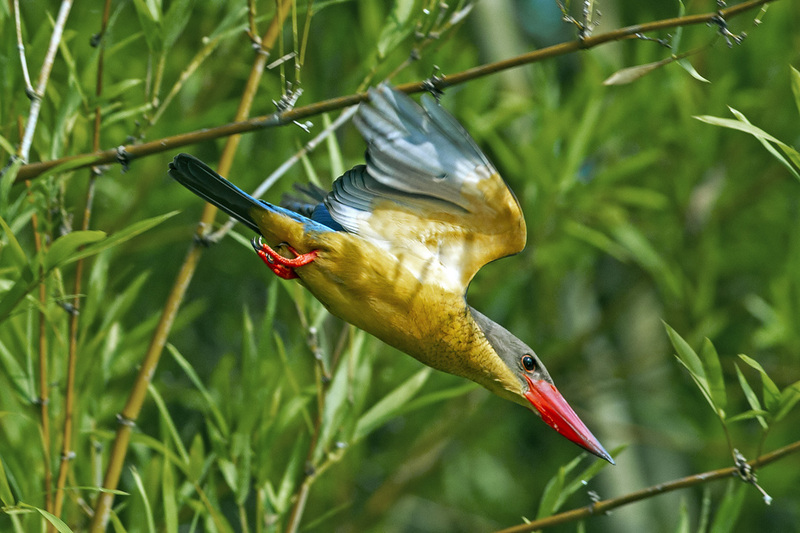 This is the largest Kingfisher in SE Asia at over 40 cms in length and it is a spectacular sight in a dive. A ballistic missile heading for some unfortunate fish. Bee-eaters are always a good subject for photography. Exotic looking with brightly coloured plumage and fierce red eyes, all combine to make a dramatic image. 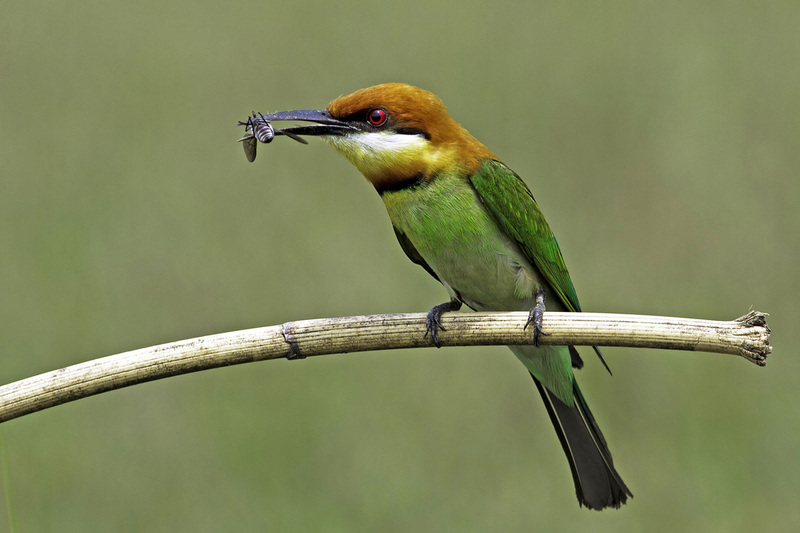 With an insect prey in its beak it is even more compelling I therefore chose this Chestnut Headed Bee-eater as an entry in the Andalucia Bird Society's first quarterly photo competition, in which it was awarded First place. Second place in the same competition went to this entry of a Squacco Heron. I actually took this photo in April 2012 at the Charca de Suarez Reserve in Motril, however as I had not posted it previously I choose to place it here together with the winning shot of the Bee-eater. Broadbills are extremely photogenic with large faces and bills, clear eyes and often superb colours. The Long Tailed Broadbill is no exception to this rule and here I caught one listening intently for sounds of insect or larval activity in the branch that serves as a larder as well as a perch. Forest light is not perfect and my ISO was set to 1000 accordingly, but I captured enough colour and detail to make this shot worthy of another gallery entry for May. The Red Bearded Bee-eater is a stunning species. This was taken deep in the rain forest fairly high up in Kaeng Krachan National Park near the Myanmar border in Thailand. We drove a long way on pretty rough roads in a rugged 4x4 then walked into the forest to find the nest site where we stood quietly waiting. Suddenly they appeared, first a female, then the male in the picture. They did not seem at all perturbed by our presence even though they obviously had young in the nest hole in a sandy bank, judging by the number of insects they brought. The light was poor in the forest so I had to set my ISO up to 3200 and aperture wide open on f5.6, so all things considered I was well pleased with this shot, a memento of a magic moment in the presence of such exotic beauty. Another Black & Red Broadbill in another Country, this time Thailand at Kaeng Krachan National Park. This is such a photogenic bird and for once the light was good, out in the open instead of under the forest canopy. I also like the composition here, the branches act as leading lines drawing the eye onto the bird at the centre. Therefore it is worth a gallery spot even though we had one already. The Silver Breasted Broadbill is a very beautiful bird. It really is silver, with royal-blue and black wings, large eyes framed in gold set in a jet black eyestripe. Even the characteristic broad bill of the species is silver. Simply stunning. I took this and similar photos in Kaeng Krachan National Park, Thailand. A fabulous birding destination. I must say that the National Parks and Reserves of Thailand are a credit to its people and government. So much forest is disappearing so fast that there will be nothing left very soon without this kind of government protection. The Rufous Bush Robin is a difficult bird to locate. In Europe it not common anywhere and is only really found around the Mediterranean. It breeds in South Iberia however and we were lucky enough to be taken a nest site by wildlife guide Mick Richardson. We stayed in the car at a a discrete distance and were treated to clear and close views of this bird on the post of a nearby chain-link fence. A good sighting and another lifer for me. Thanks go to Mick for another excellent wild bird encounter. The rarity value and quality of the photograph make this a gallery entry for June. 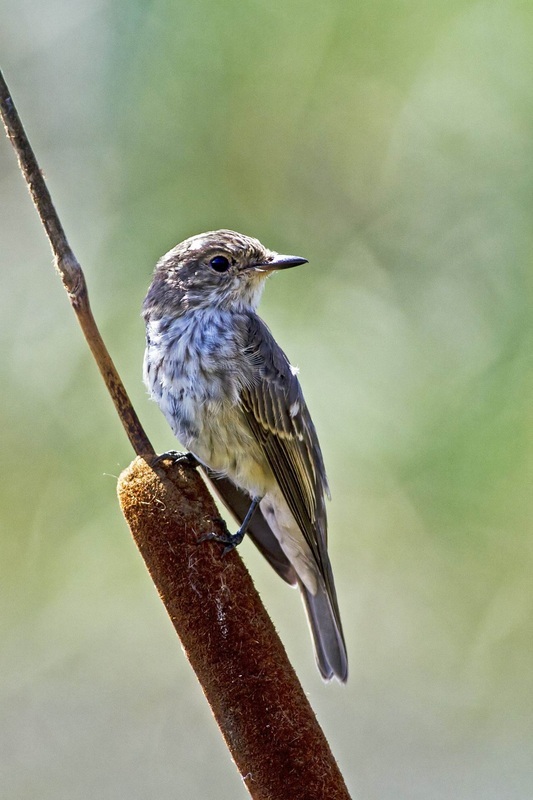 Spotted Flycatchers are the easiest birds to photograph. They like to perch in open conspicuous positions and are not wary of people. They frequently return to the same perch after a fly-catching foray, so if at first you don't succeed.... have another go. This one sat nicely on a large bullrush in front of a hide at the Charca de Suarez. Good sharp focus, attractive composition and colouring, particularly the soft green bouquet (background light) give this shot a little extra oomph and make it worthy of a gallery entry for August. September and October were difficult as my camera had finally given up the ghost from excessive use. For September therefore I post an old photo that achieved third place in this second quarterly photo competition of the Andalucia Bird Society. The theme this time was Garden Birds and as the Zitting Cisticola is frequently seen in and around the fincas here it qualifies it as a Spanish garden bird. 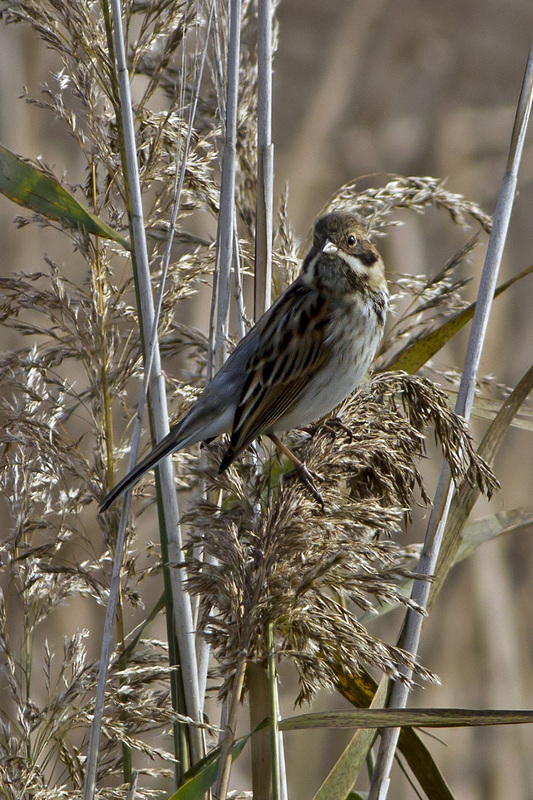 A Reed Bunting makes an attractive picture as it perches in the tall reeds by the lake at Sarinena, in the Province of Aragon in Northern Spain. 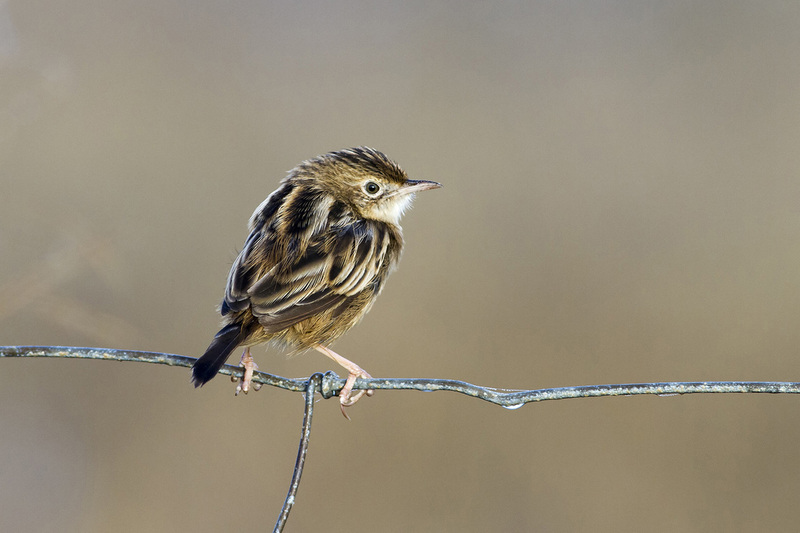 Reed buntings in Spain are mostly Winter Visitors. 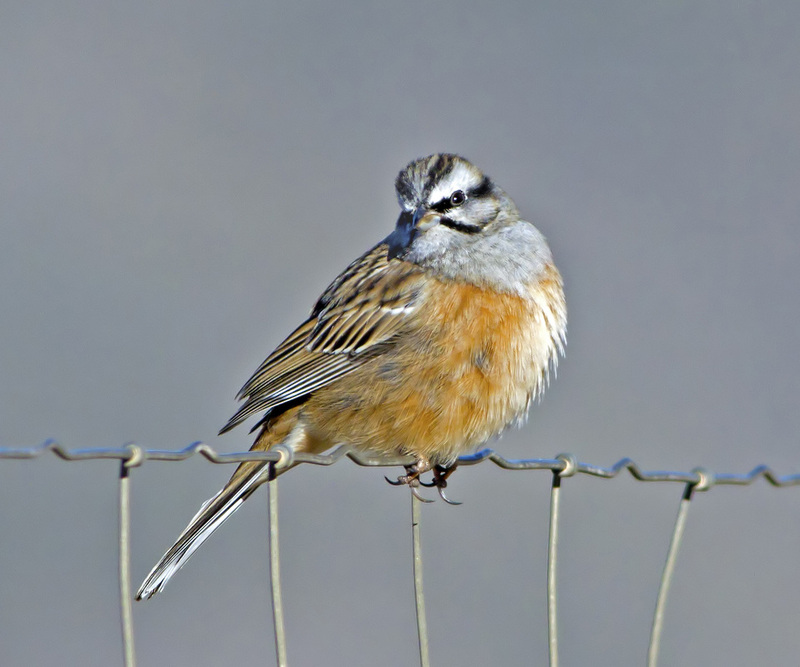 The Rock Bunting is an attractive bird that frequents high ground with rocky slopes and scattered scrub in Southern Europe. Not uncommon in the Sierras of Andalucia, this one perched nicely on a fence by the rocky road that leads up to the Sierra Loja, near the town of the same name in the Province of Granada. 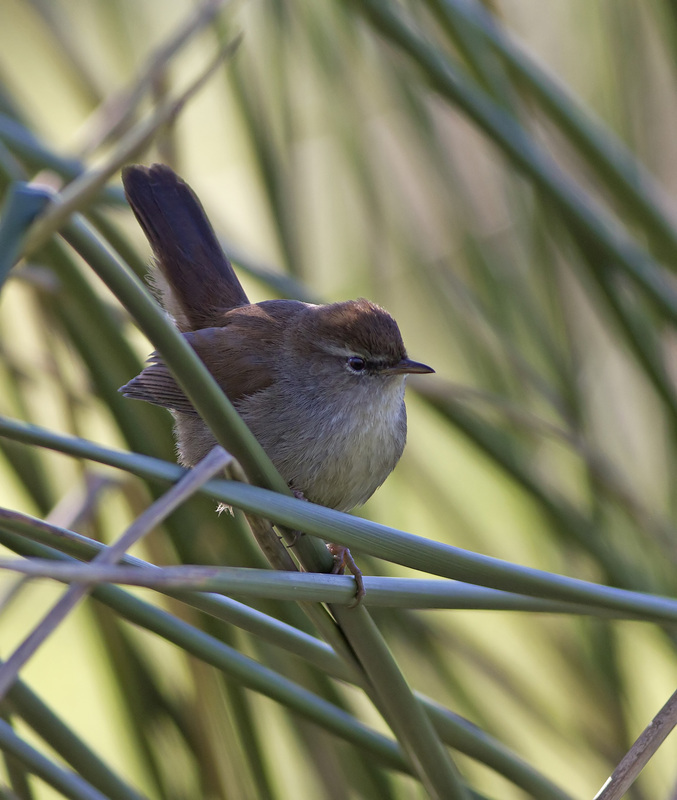 Cettis Warblers are found wherever there is freshwater in Spain. Conspicuous mainly because of their extremely loud call which can be quite piercing ﻿w﻿hen close-by. This one announced its presence in the reeds by the Rio Velez and I managed to get a decent photograph of a little bird that is more often heard than seen.